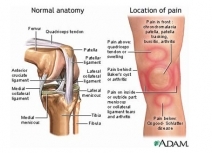 Ligament Sprains - ligaments are bands of strong tissue that stabilize the knee joint together. Overstretching can cause the ligament fibres to tear and bleed into the surrounding tissues, causing pain, swelling and a feeling of 'giving way'Severe tears may require surgery. Cartilage Tears - cartilage also helps stabilize and protect the knee joint. Pressure from twisting and turning during weight-bearing exercise like squash may tear the cartilage, causing pain, swelling and locking of the knee joint. Tendon Strains -tendons are cord-like bands that connect muscle to bone. The patellar tendon connects the kneecap (patella) to the tibia (shin). Patellar tendonitis or "jumper's knee" is inflammation of the patellar tendon. This is an overuse injury commonly caused by repeated jumping, as in basketball. Patello-Femoral Syndrome - excessive friction between the surface of the patello-femoral joint (kneecap) and the femur (thigh) can result in knee pain. It may have a number of causes and should be assessed by your hysiotherapist. Knee injuries can be caused by trauma, such as an accident or a fall, or even by a sudden increase in your daily activities. Other injuries develop over time, from factors including structural problems within the joint itself, incorrect athletic training methods or technique, and poor equipment. Footwear -a new pair of athletic shoes or a change to heels instead of flats can affect the way you walk and, in turn, can place stress on the muscles and tendons around the knee joint. Any change such as jogging or playing tennis on a different surface can affect the knee joint. For example, simply moving the activity from a soft track or clay court to a hard surface such as a road or hard court can add stress to the knee joint and increases the risk of injury. Stretch before, during and after activity. Stretching as a warm-up, as a break during repetitive movements and as a cool-down helps you to move easily, keeps your muscles flexible and relaxed, your joints mobile and relieves tension and strain. Move - today for tomorrow. Get moving. Keep moving. Stay moving. Through the seasons. Through life. Maintain good general fitness and lower body strength. Add it up - an hour is power. To gain mobility, plan activities throughout your day that keep you moving for periods of at least 10 minutes. To maintain your mobility, make every movement count. Add up all you do in a day and aim for a minimum of 60 minutes of movement every day. Reduce strain - vary activities and use proper biomechanics to achieve a good balance of muscle development. For example, where possible, don't twist your trunk first when turning - instead point your feet in the direction that you want to go to and let your body follow. Talk to a physiotherapist - physiotherapists are healthcare professionals who help people of all ages and lifestyles gain and maintain their desired level of active living and physical mobility. With their applied knowledge and understanding of the human body in action, physiotherapists are able to help you to increase your mobility, relieve pain, build strength and improve balance and cardiovascular function. Physiotherapists not only treat injuries, they also teach you how to prevent the onset of pain or injury that can limit your activity.